We could say that by just looking at the plight of Southern European countries after years of EU-imposed austerity, where trust in the European project is fading, while the euro currency is increasingly under question. This time however, we look eastwards at big, bad Visegrad. 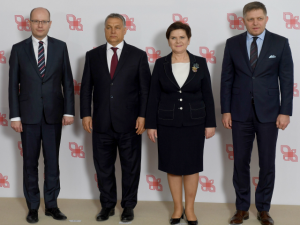 This group, composed of Poland, Czechia, Slovakia and Hungary (see leaders, pictured below), has both shared and separate interests. This is unbearable for the EU leadership, who loves diversity and wants to pass it off as a way forward, unless it’s diversity of opinion, a core tenet of the liberal democracy they claim to represent. Liberalism that once was about “I disapprove of what you say, but I will defend to the death your right to say it’’, a quote maybe erroneously attributed to Voltaire, has now become “I disapprove of what you say, so just don’t say it’’. The problem is even deeper. The Visegrad bloc gained independence from a forced solidarity over another international project, the Soviet Union, less than 3 decades ago. Their experience makes them wary of unelected, centralized utopias. And yet once again they found that they have been entrapped in another one. Just when they thought they left one dystopia to join the free world, the free world itself has turned into one. Solidarity is voluntary, it can’t be forced. Angela Merkel’s approach resembles that of the Soviets rather than free people. They just don’t like multiculturalism, forced solidarity and the new fads of Western European leaders (which truth be told aren’t liked by Western Europeans either), as confirmed by the widespread support enjoyed by the anti-multiculturalism leaders of the Visegrad bloc within their own countries. So is the bullying by Timmermans justified or even desirable? In effect, he is antagonizing the only remaining EU-phoric side of the Union. 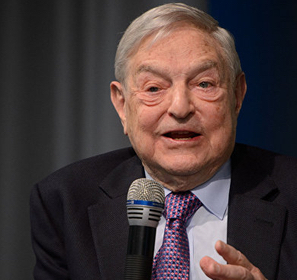 What can be said about leaders that prefer oligarchs to people? Can they be considered ‘’democratic’’? Poland does not want judges compromised under the previous governments in its Supreme Court. This is a touchy issue as separation of powers between the legislative and the judicial is a key component of liberal societies. In most countries, however, governments appoint supreme court judges whose position is in line with the governmental priorities. The problem? The Polish government is eurosceptic, and the EU does not want euroskeptic judges to be appointed. Hence, as usual, Timmermans now wants to strip Poland of its voting rights,9)for something every government does. It’s only bad when the side Timmermans doesn’t like does it. One wonders how long it will be before the Central-Eastern European bloc, the only one enthusiastic about European integration right now, loses patience as well? Will it be Italy leaving the euro first? Is the Visegrad bloc really the problem for daring to disagree, or is it the tolerant-intolerant EU leadership? 1. ↑ Poland’s Kaczynski blames Merkel for EU’s migration issues, Reuters 2017-05-20. 2. ↑ Timmermans: Central Europe has ‘no experience with diversity’, Politico 2015-9-24. 3. 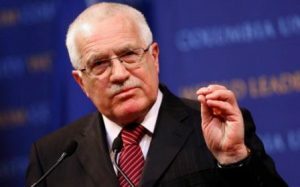 ↑ Václav Klaus: Nastal čas začít připravovat odchod naší země z EU, parlamentnilisty 2017-06-13. 4. ↑ Polish minister blames multiculturalism for Nice attack, Financial Times 2016-07-15. 5. ↑ Orbán : “Multiculturalism has failed in Europe”, Visegrad Post 2017-06-30. 6. ↑ Why Slovakia won’t embrace migration, Politico 2016-08-26. 7. ↑ Enthusiasm for EU in sharp decline throughout Europe, not just UK, Financial Times 2016-06-07. 8. ↑ Soros gets warm Brussels reception amid spat with Hungary, Euractiv 2017-04-21. 9. ↑ Poland may be stripped of EU voting rights over judicial independence, The Guardian 2017-07-19.